I’ve yet to jump on the spiralizer train but this rice noodle bowl is about as close as I come. You could easily use spiralized carrots in this recipe but I prefer the slightly larger ribbons of carrots, using a vegetable peeler. I recommend making this bowl right before eating as the rice noodles soak up all the sauce. If you’re looking to whip this up as a make-ahead lunch or dinner, use a different noodle and double the sauce to add a bit more right before eating. 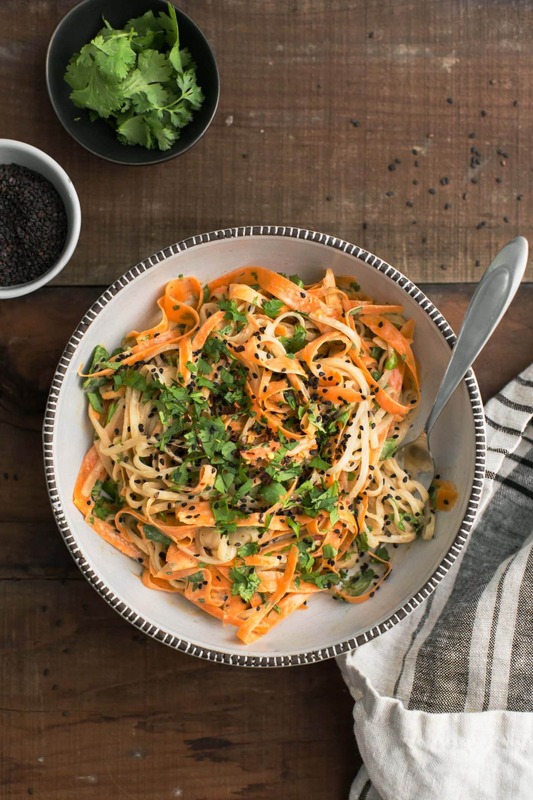 A beautiful vegetarian noodle bowl with raw, shaved carrots, rice noodles, and an easy tahini sauce spiced with sriracha. Cook rice noodles according to package. Drain and reserve part of the water. Rinse the noodles and toss with the carrots, cilantro, and sesame seeds. In a separate bowl, stir together the ingredients for the sauce. Thin slightly with reserved water, 2 to 3 tablespoons. Taste and adjust flavorings as desired. Start with 1-2 teaspoons of sriracha and add more depending on spiciness wanted. Pour the sauce over the noodles and toss until well coated. Serve with a sprinkle of sesame seeds and cilantro. Tips & Tricks: Make the sauce ahead of time and use as a dip or drizzle for summer rolls or other noodle/grain bowls. I started making my rice noodle bowl with a peanut sauce but I’ve found over the years that I gravitate more often to this tahini sauce. I always have tahini on hand for making hummus and it’s a great way to get a nice, smooth sesame taste in the sauce. If you’re feeling adventurous, you can make your own tahini. Vegetables: You could feasibly add any type of vegetable to this bowl. If you’re looking to stick with the ribbon vegetables, zucchini, sweet potatoes, and summer squash are all really good choices. I also like to add thinly sliced red peppers and scallions. Noodles: As mentioned above, the rice noodles soak up the sauce quite a bit, more than other types of Asian noodles. I also like this bowl with soba or somen noodles. If you already have a noodle on hand, try that first. Hot Sauce: I rarely keep sriracha on hand anymore and prefer the sambal oelek. This sauce works with either, just adjust the amounts for the level of heat you like. 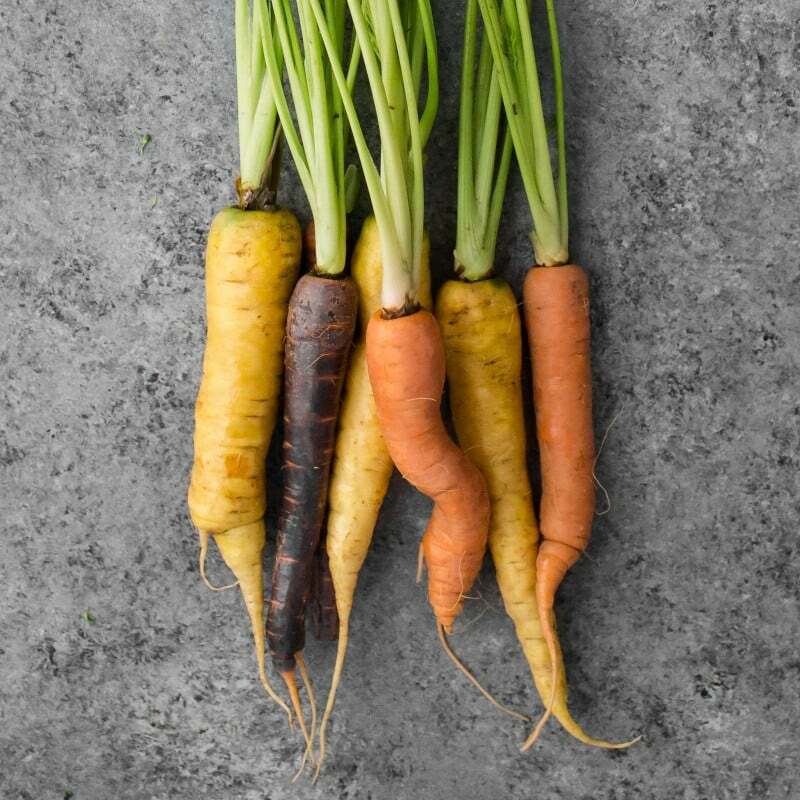 I have a deep love of carrots being the star of a recipe. Carrots are easy to find, good for you, and can be prepared in many different ways. If you buy your carrots with good greens, make sure to remove upon returning home and make some carrot-top pesto. First published on April 21st, 2014. Last updated on June 30th, 2016. I SO agree with you on this, cooking at home is one of the best things we can move towards, without a doubt! Noodle bowls are one of my favorite meals! This recipe is lovely! Beautiful images. Thank you for all that you do! Cooking at home, supporting your local farmer, and being as educated as you can about the food you put into your body is SO gosh darn important. Your approach to cooking is so simple and approachable I am always inspired here. Thank you! That sauce! I want to smother it all over all the things. I think about this a lot too as I am training to be a holistic health coach and want to make sure the recommendations I give to clients are not overwhelming but create positive changes. I agree that it just starts with baby steps to make lasting, sustainable changes to our diet and health. It’s that crucial mindset shift that everyone else here has said is so important; realizing the impact that simply getting in the kitchen more and increasing the amount of whole foods, fruits, and vegetables in our diet can have on our bodies and our lives. 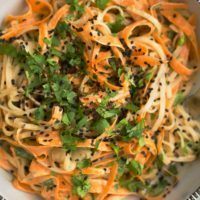 Love noodle bowls, they’re the perfect ‘pasta-style’ meal for Spring, and this one with carrots and tahini sauce looks delicious. I love any kind of “bowl” recipe, it is my favorite way to eat. And anything that has sriracha in it is a must try in my book. This looks so fresh and so tasty, also a great way to add some extra vegetables into dinner! Beautiful photos! A beautifully vibrant noodle dish. I try my best to buy organic food as often as I can but my golly sometimes the price difference is insane and it does price me out, sadly. I’m lucky enough to live somewhere where there’s a massive local farmer presence, so I buy local alot. In some cases it can be a bit more expensive but not severely so and the quality/freshness is waaay better. I think it’s just a case of do your best to feed your family the best food you can. I think making meals with love and sharing them as a family is the most important thing. Amen, sister. Love those carrot noodles. I made this dish last night! It was so tasty! Love this recipe Erin. And I totally agree with you on this! For years I could do all my groceries at the Dutch version of Whole Foods (only 3 stores at that moment, now 6 I believe), buying local and organic products. But now -living in LA on one income instead of two- I had to get used to spending less money on my dearly beloved organic and local produce. It was hard for me, because I don’t ‘trust’ big brands. So now I’m keeping it real and go to the Farmers Market for fruit and vegetables and my butcher shop offers good organic raised and local meat for not that much money. We don’t eat meat everyday and the rest of the produce I get at Trader Joe’s, but I’m still struggling with some of their products. I do what I can but it’s not possible for everyone to avoid big brands. I’ve seen a lot of documentaires on this subject and it made me sad (and still makes me sad as I watch them over & over again). This was amazing. I’m on a gluten & dairy free diet and this recipe was so wonderful. A lot of flavor & very versatile. I added shrimp and it was amazing. The Tahini-sriracha sauce is REALLY WONDERFUL! Thank you! I use agave for the sweetener and I added some peanut oil to make it go a bit further…and I’ve been using it for MANY things. Very delicious!!! Ah yes!! Love everything about this! 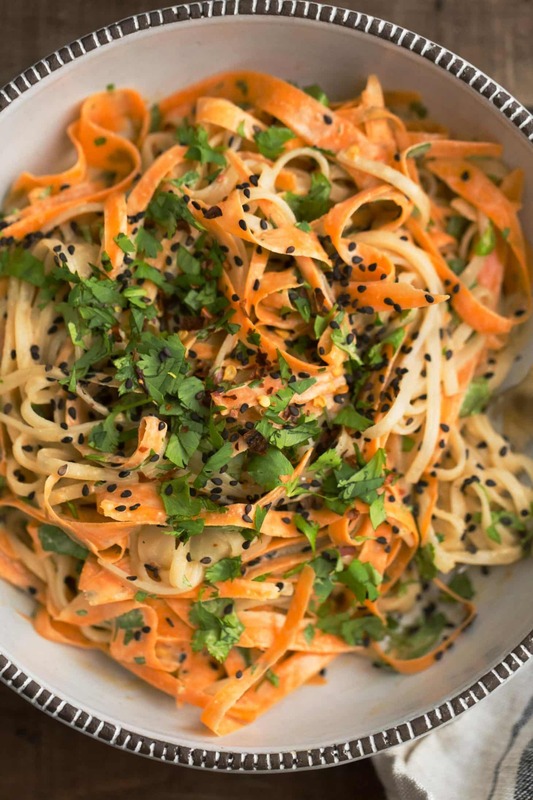 Spiralized carrots….tahini…yes! This may be a silly question, but why are the sesame seeds dark? Are these a different kind, or did you brown them? 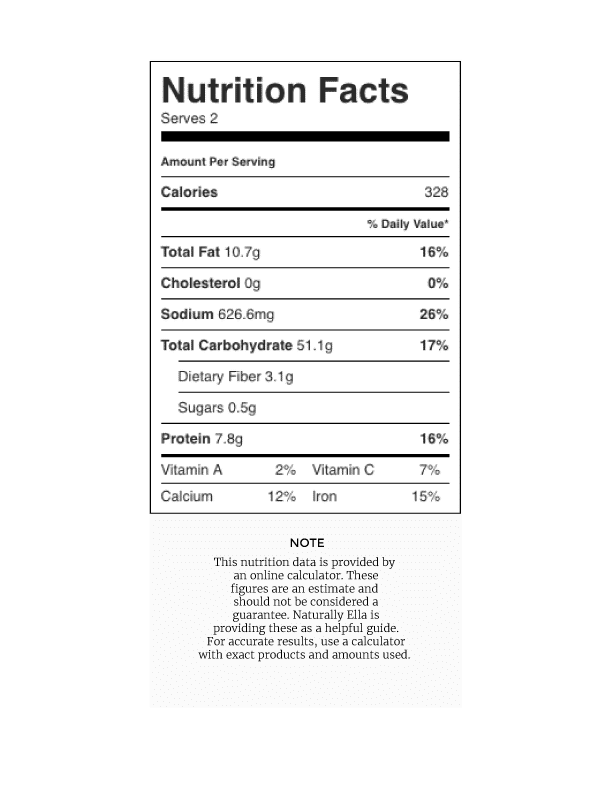 I prefer the original version of the recipe…it would be nice if that were still available. I didn’t change the recipe 🙂 Just re-wrote the directions slightly. Made this tonight and my husband and I loved it! It’s so easy, with ingredients I normally have on hand, what a bonus! I am loving carrots lately, and this recipe is different from the (mostly roasted) carrots I’ve been preparing. I think this recipe will go into regular rotation at my house. Thank you!